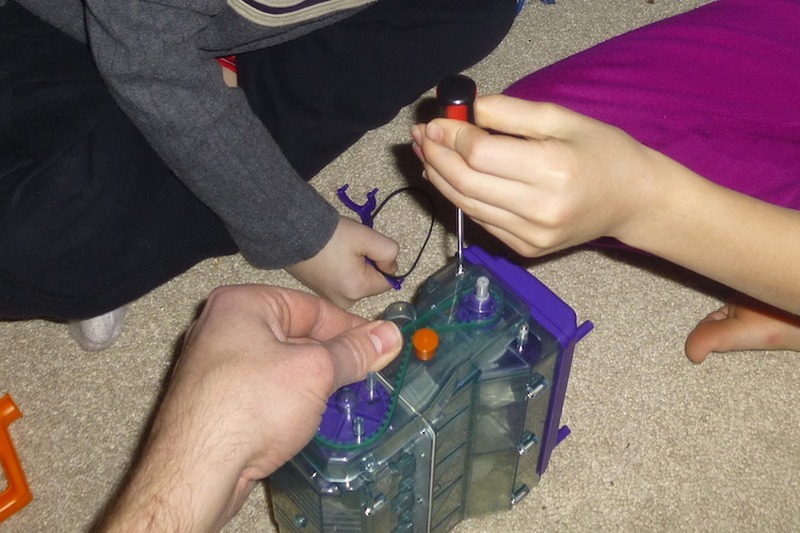 Garage sales are great for finding random, interesting things to do with the kids, usually for dirt cheap. 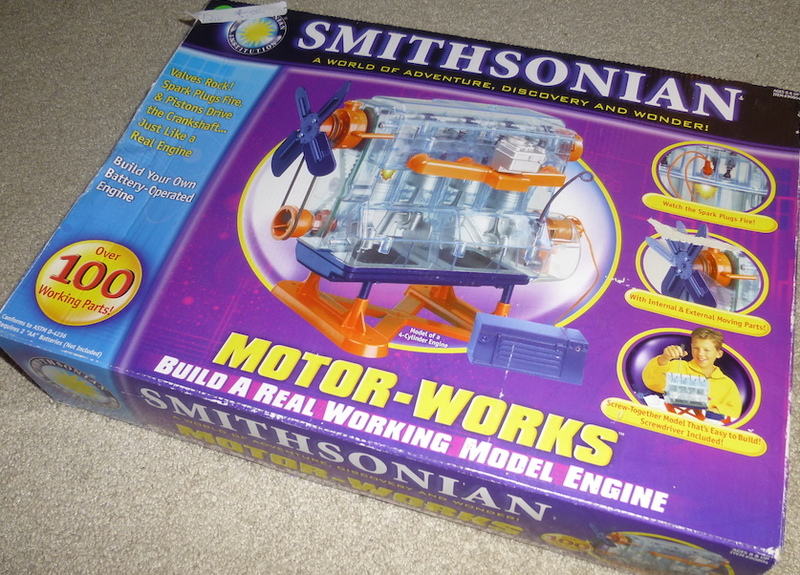 Last summer, I found this “Smithsonian Motor-Works” set for $5, which I figured was a steal. 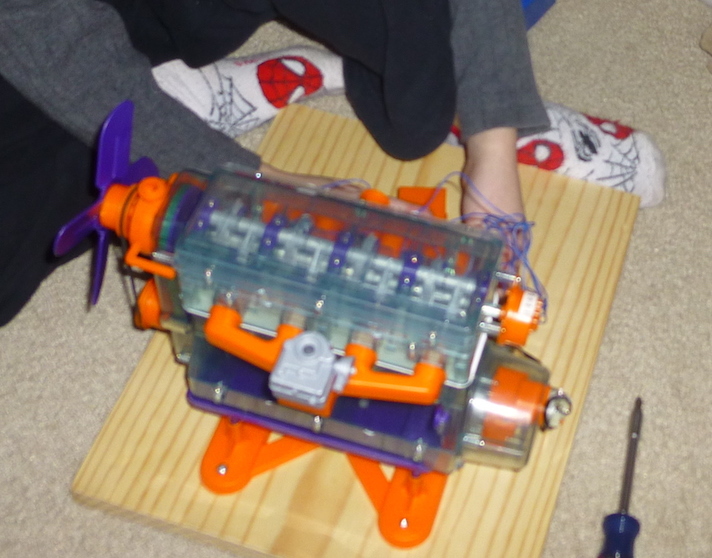 Once built, it’s supposed to model a 4-stroke internal combustion engine. I’d shelved it for a rainy day and completely forgotten about it, then rediscovered it last weekend during an overdue cleaning session in the basement. The girls were at a play and the toddler was napping, so it was the perfect time for a little father/son bonding over a cool project. Although the concept is awesome, the materials are not. I wouldn’t recommend ever buying this at full price. Amazon ratings are abysmal, mostly because of thin/cheap/missing parts. The Smithsonian is a respected name, and shouldn’t have partnered with a manufacturer who has a ton of complaints with the BBB, mostly for quality. I’d be hesitant to buy another similar toy with the Smithsonian label on it. If you somehow end up with one as a gift, then read on! Hopefully I can help you avoid a few issues. Read through the Amazon reviews too. Plenty of helpful suggestions in there before you get started. 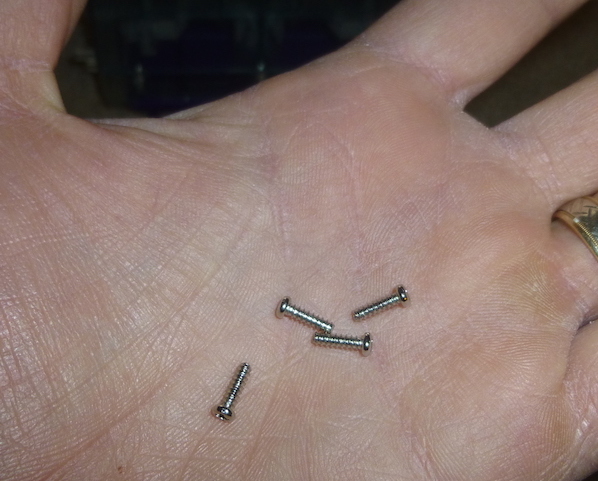 It was mostly screwing everything together in the right order… lots and lots and lots of tiny screws. The cheap kind with the heads that strip while you’re screwing them in. Luke would start the screws, then I’d finish them up. That worked out well, since it was tough to apply enough force to not strip the head, while applying the minimal force necessary so the plastic didn’t crack (which almost happened a few times). There were about 60 screws in the set, and only 2 left over, so no room for error. One of the most common complaints was misaligned holes. It happened to us when we inserted the valve into the cylinder head, seen below on the lower-right. 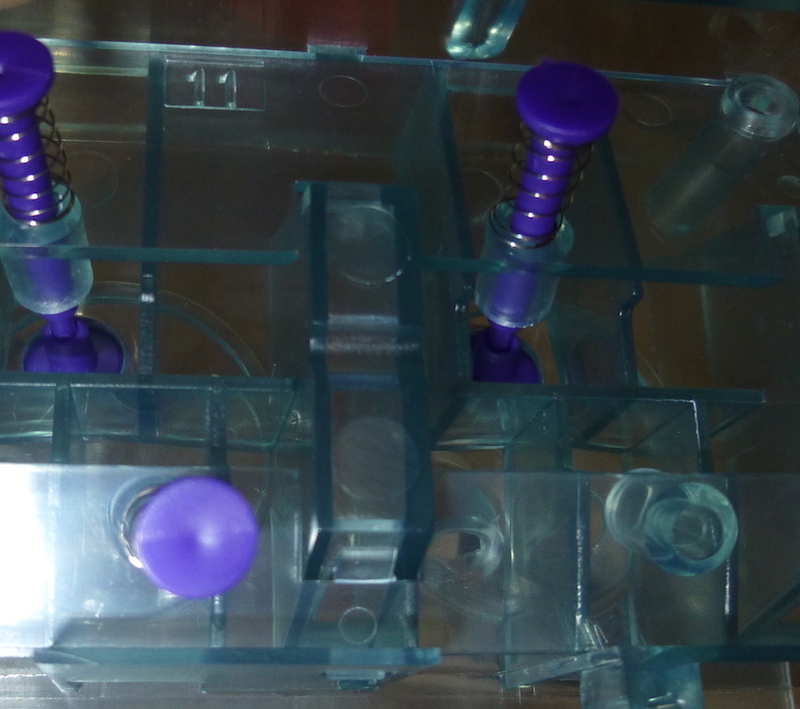 The upper hole didn’t quite line up with the lower, so the valve (purple pin) would stick instead of springing back. 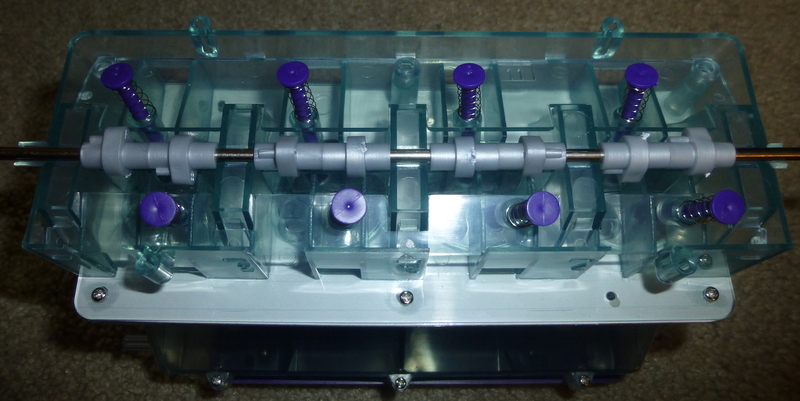 The valves need to slide back and forth (open and close) freely. The plastic is thin and malleable (not really a good thing… cheap “feel”), so applying some pressure to it for a few minutes was enough to bend it back to the right position and make it stay. 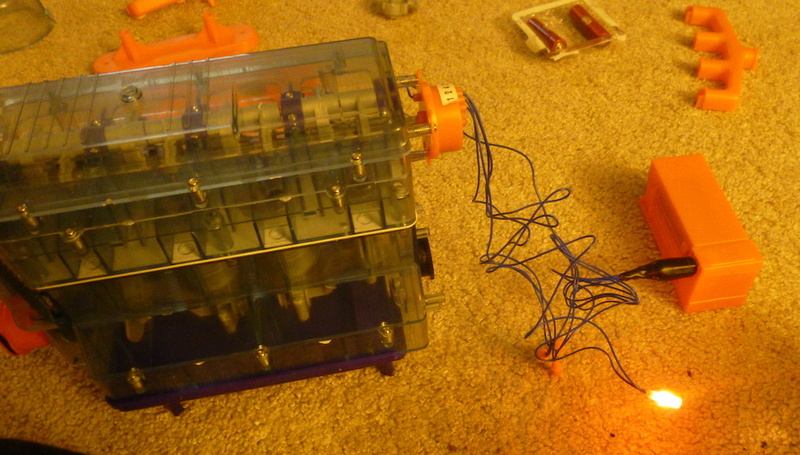 The instructions were decent for the most part, but the diagrams could’ve used some work. Here’s one that shows the camshaft with the cams lined up a certain way. There are indicator lines on the cams to indicate which way they should be installed. That’s helpful. Unfortunately, half of them aren’t visible in the diagram due to the orientation of the sketch. 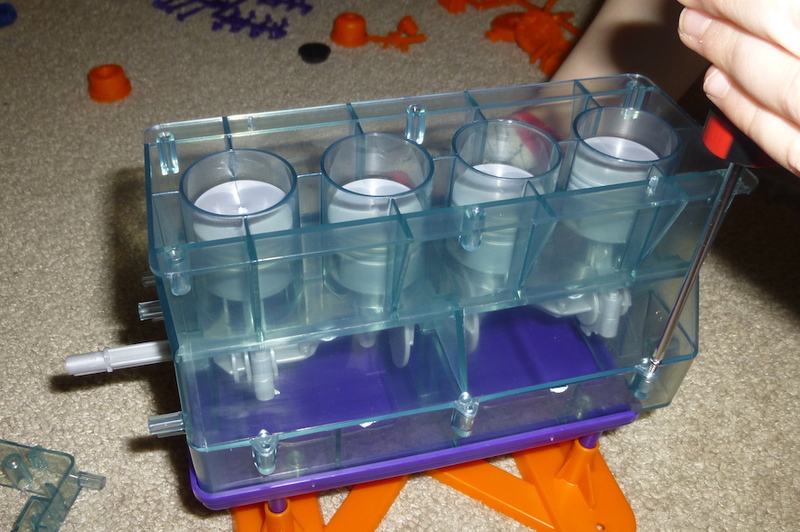 Not so helpful, as you end up guessing which way half of them should go, and hoping they line up correctly with the valves, so they’ll open and close them. 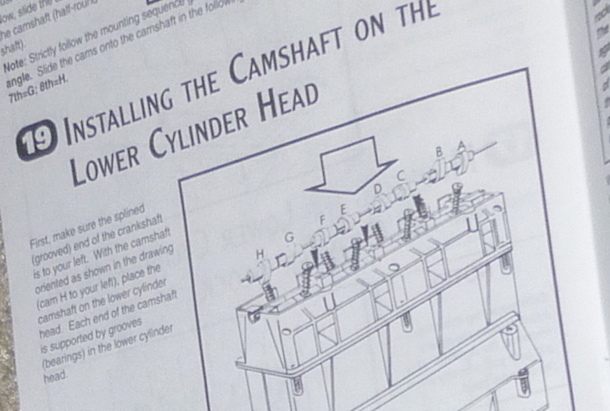 Here’s the camshaft, oriented just like the diagram. Here it is again, rotated 180º so you can see the indicators on the other side. Even an inset inside the larger image would’ve helped. Not that it’s a huge deal if you have to fix it, but every time you have to remove the screws you risk stripping them out. For the most part though, it went well. My daughter jumped in when the girls got home. 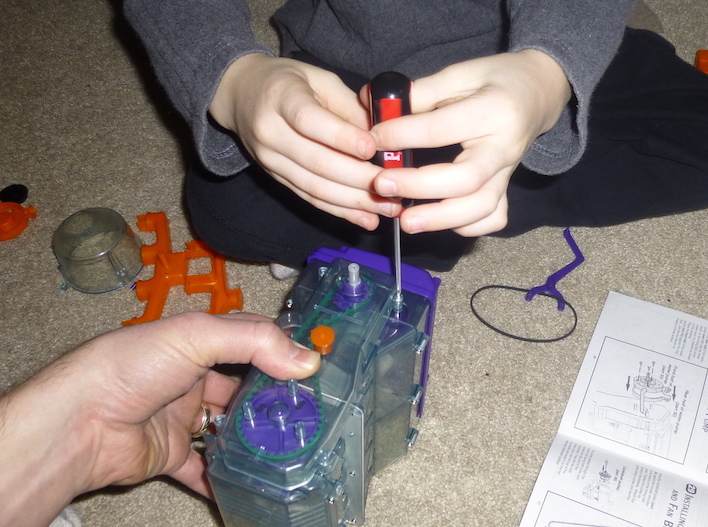 Here we are, attaching the cylinder block to the lower crank case, after assembling the crankshaft and piston assemblies, and then later installing a cover over the timing belt and pulley. 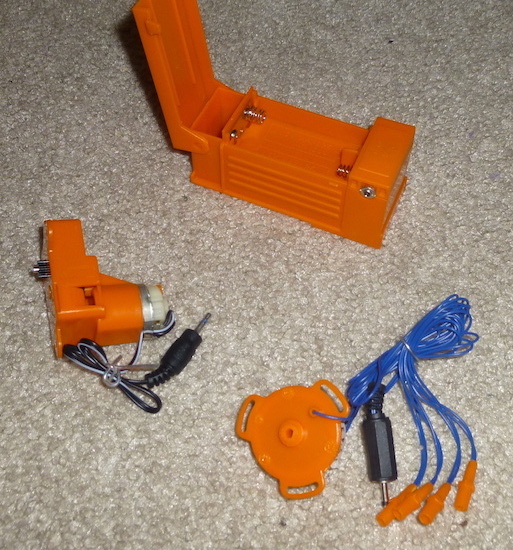 Here’s the motor, battery compartment and spark plug lights. I thought the headphone jacks were a nice touch, until we ran into another quality issue. 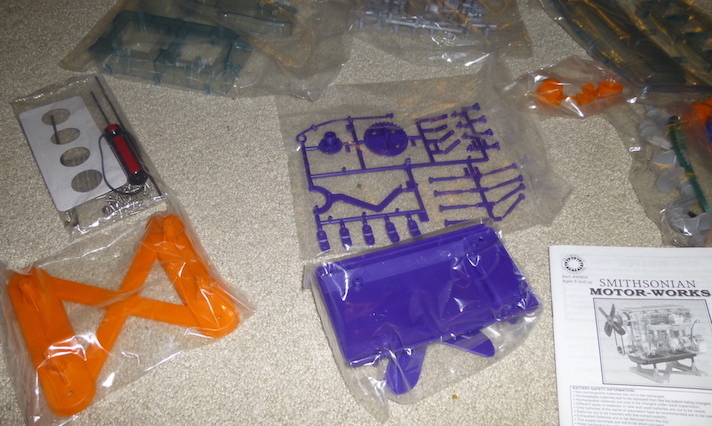 The plastic shielding on one of the jacks literally fell apart in my hand. It just crumbled. 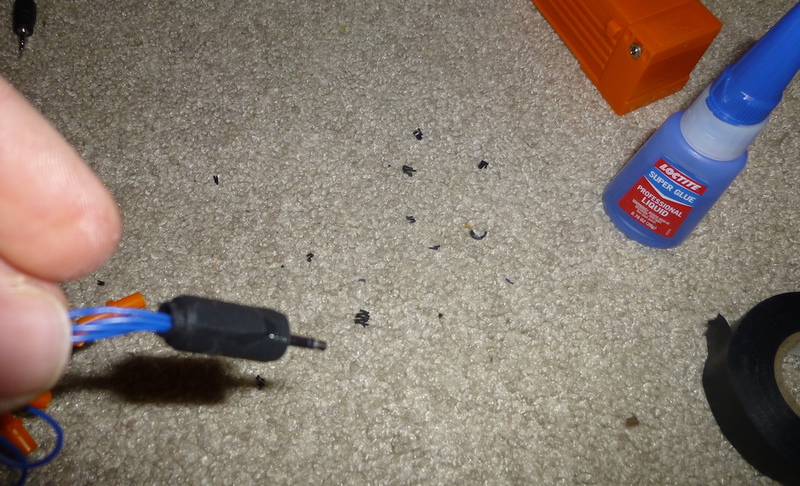 The black part by my hand ended up splitting into several pieces too. I managed to glue it back together and then wrap it in electrical tape. The toy’s not that old, and even if it were left somewhere really cold, nothing else on the toy was remotely brittle, not even the other jack. Sigh. A few hours in, and we were getting pretty close to finishing it up. The manual has you do some final calibration to make sure parts are lined up correctly, so the “spark plugs” will light up when the pistons are in the correct positions. I mounted the finished product – engine and battery compartment – to a spare piece of wood (left over from my bed bunk project) for easier transport. When my parents came over the next day (I was at work), my Dad took the time to explain how it all worked, which was awesome. He’s been a car enthusiast for a long time, so I think he enjoyed seeing it and getting to teach Luke about it too. There’s a half-dozen pages dedicated to how it all works in the manual, which goes great with the model. You absolutely cannot help reading it without thinking, how in the world did we ever get this to work?! Your car is literally exploding gasoline (in very small amounts) 50x a second! Here’s a short video of the finished product. Sounds like a washing machine, but everything works! You can see the pistons moving up and down, and the spark plugs firing when the pistons are near the top (end of the compression cycle). Have you ever put anything together like this? Do you know of any better models than what the Smithsonian produced? 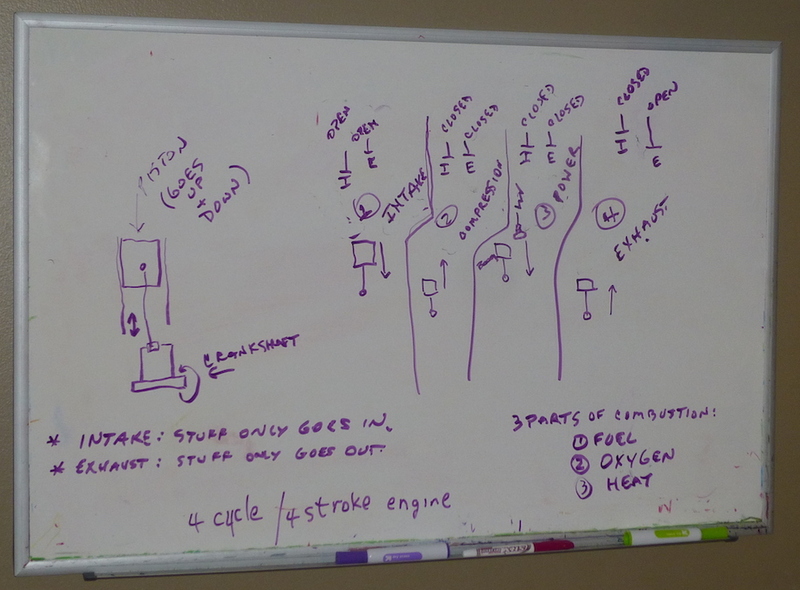 You can find all kinds of animations on YouTube about how a 4-stroke engine works.